"What a beautiful little town - Galva!" Like the peaceful study set apart from the hustle and bustle in a large mansion, Galva is situated only 5 miles from metropolitan McPherson in central Kansas, and offers a peaceful life with quiet evenings and relaxing weekends. Main street is wide with clean sidewalks cooled by a continuous canopy of aged shade trees. Sitting on a downtown park bench, watch the children ride their bicycles to and fro, and feel the pride these residents have in their well-trimmed lawns and maintained homes. If you're just driving by on Highway 56 you won't want to miss the Emporium Antique Mall and while browsing through the past, the museum on main street offers a glimpse of area history. Drive around town - it won't take long - you're always Welcome and Welcomed to Stay!. Originally, the city of Galva was located at the Santa Fe Railroad Crossing of Running Turkey Creek, two miles south and one mile east of its present location. It was a Pony Express station, established by Joseph Colby, a land agent, in 1871. From a sod house serving as the post office, the town then called Empire grew quickly and supported the largest grange in McPherson County. Empire hoped to acquire a railroad to assure growth and prosperity, but the prosperous outlook plunged when a branch of the Atchison, Topeka, and Santa Fe Railroad was completed in 1879, passing north of Empire. Feeling dismayed and forlorn, the citizens of Empire moved lock, stock, and barrel to the present location of the City of Galva - which was on the railroad. A town meeting convened and a choice of naming their town either Trenton or Galva came to a vote. 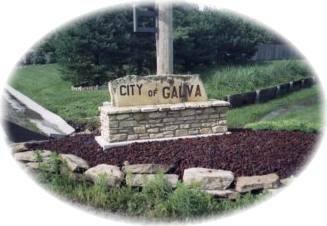 Galva, the name of choice, after Galva, Illinois, where some of the people were originally from, was chartered in 1879. The World War II Memorial is painted on the wall of this building located across the street from the Galva Museum in downtown Galva. Whether you are looking for family gatherings or a one on one outting, Henry Park is the place with plenty of well kept grass and a shaded playground area with a picnic shelter, tables, restroom, and a tennis court.